As a manufacturer, your Web site is often the first point of contact for customers, and in some cases their only contact. With over 17 years of expereince building Web sites for manufacturing companies in many industries, we've got the expereince and team you need. 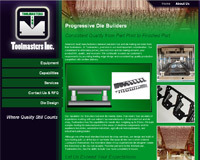 See below examples of how we've helped other manufacturers build solid Web presences, showcasing their products and providing great support, both for sales and support. Industrial metering pump manufacturer, Madden Manufacturing designs and manufactures diaphragm type metering pumps for chemicals and industrial steam system equipment. Their mechanically actuated diaphragm design makes irritating hydraulic systems and cheap solenoid driven pumps look like a headache. Their pumps include continuously lubricated bearings and shafts to assure many years of dependable pumping service and the heavy duty diaphragm also keeps the chemical from penetrating the inner gear works of the pump. When it’s time to replace worn wetted end parts the job is quick and easy, and accomplished with the use of common tools. Need a custom system, Madden can also build entire pumping systems. Madden's boiler blowdown equipment includes heat recovery systems, blowdown tanks and separators as well as orifice meters and sample coolers. 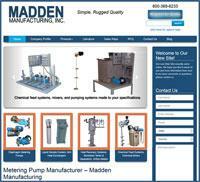 To learn more about Madden Manufacturing's Industrial pumps, contact them today! Universal Bearings is a worldwide bearing manufacturer of high-volume, precision engineered and manufactured loose needle rollers and needle bearings. Over the last half of a century, their products have become a staple in the automotive industry and their commitment to precision manufacture with high quality standards has made their products a welcome addition in new markets that include medical equipment, marine boat engines, factory conveyor systems, industry alignment pins, and the manufacture of office equipment such as copiers and printers. Strict attention to detail, focus on precision, and commitment to customer satisfaction have also made Universal Bearings products welcome in a wide range of industrial markets that desire superior quality in competitively priced industrial bearings. Long noted for their focus on customer satisfaction, their experienced engineering and design team can custom design a bearing assembly to fit your industrial application or help you fine-tune your design to provide optimal performance. As with all Universal Bearings products you'll receive superior quality in bearings systems at competitive prices. 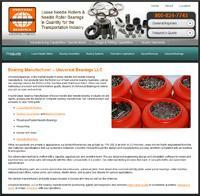 For more information about their bearing products, contact Universal Bearings today! At United Coatings Technologies they are a leader in supplying paints & coatings for architectural, commercial & industrial applications. They don’t just sell paints & coatings, they are committed to our clients and listen to their needs. After all theyknow that anyone can sell you paints or coatings however, they understand that there are few instances where one product will fit everyone’s requirements. Their architectural coatings from PPG provides a variety of paint and related products that are simple to use, long lasting and perform well above the competition. 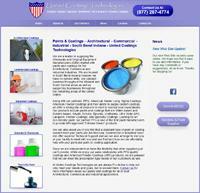 LEED commerical coatings include drywall primers and zero VOC primers and paints. For OEM manfucturers they offer a a complete line of industrial coating products and industrial paint supplies to meet or exceed your coating requirements for Wood, Metal, Industrial Maintenance, or Concrete applications. 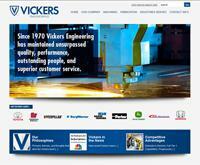 They also provide technical support at no additional cost. Their team of experts can help with on-site pre-application consulting and they also provide instructional support for the actual application of your product. Their on-site technical assistance is a major benefit to getting it right the first time, every time. Contact United Coatings Technologies for more information about their paints and coatings for all of your Architectural, Commercial and Industrial applications. EFP Corporation is an industry leader in providing exceptional foam molding and fabrication solutions. Since the 1950’s, EFP has been committed to developing innovative expanded foam products to successfully meet the needs of thousands of companies worldwide. Whether your custom foam fabrication needs are for insulated shipping containers, foam building insulation, or auto insulation for cargo covers or sound reduction, EFP has the expertise to provide a customized solution. Contact EFP for more information on your custom foam fabrication needs. 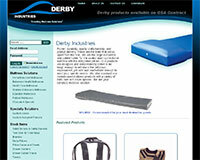 Their fifty-plus years of experience across a wide range of markets enables them to provide a solution for your needs. 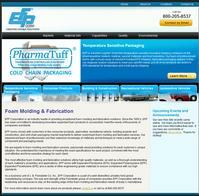 PharmaTuff ® by EFP Corporation offers cold chain packaging solutions. Their Pharmatuff ® brand of shippers have been designed to meet the demanding expectations of todays sophisticated logistics networks and regulatory requirements. All of their products are tested to ISTA standards for temperature and small parcel shipping. EFP Corporation offers a variety of solutions to your temperature sensitive packaging requirements with their broad range of standard molded EPS shippers, fabricated packaging options, or engineered custom solutions to your specific needs. Whether your product needs to be kept frozen, controlled to within 2-8C, or any other range of temperature profiles, EFP has the knowledge and resources to develop pack-out solutions and validations that suit your needs. Contact us for more information about our Pharmatuff ® brand of shippers today! Tool & Die Maker – South Bend Form Tool - Custom Manufacturer of Tools & Dies with General Contract Machining and Tooling Services. South Bend Form Tool Company, Inc. is an ISO 9001:2000 certified manufacturer of custom tools and dies for the aerospace, automotive and other technical industries, along with their general contract machining and tooling services. South Bend Form Tool offers tool & die making with general contract machining and tooling services that include CNC Turning, Laser Marking and complete Quality Control Assurance. Contact South Bend Form Tool for more information about their custom tool and die manufacturing.